I thought that I would perform a test on the new laptop, so I thought that I would try a slightly modified version of the script that appeared in the “Expert Oracle Practices” book in the Buffer Cache Hit Ratio section of chapter 8. The table creation part of the script tends to be very CPU intensive for an hour or two, so if you want to try the script, set aside plenty of time. The script builds a table that has 100,000,000 rows, displays the execution plan for a SQL statement that selects a small percent of the table when the OPTIMIZER_INDEX_COST_ADJ is set to 100 and again at 5, and finally excutes the SQL statements with a 10046 trace enabled. Note that the laptop only managed to achieve 3MB per second while creating the table – that was a fairly consistent average during the table creation that required 40 minutes and 29 seconds. So, the optimizer is predicting that an execution using a full table scan will complete in 44 minutes and 29 seconds, while an execution using an index range scan will complete in 40 minutes and 25 seconds. Let’s see how the different execution plans performed. The full table scan when selecting 2.55% of the rows in the table required 14.39 seconds while the index range scan required 1 minute 24.36 seconds. I guess that is not a bad improvement for leaving the OPTIMIZER_INDEX_COST_ADJ parameter at the default value of 100. 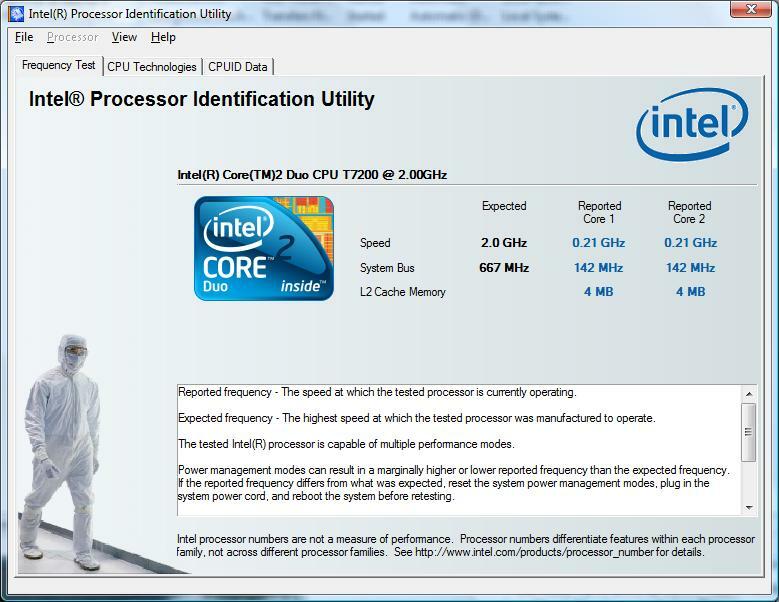 But wait, the full table scan was CPU bound, not IO bound! What if we allow the SQL statement to use more than 1 CPU? 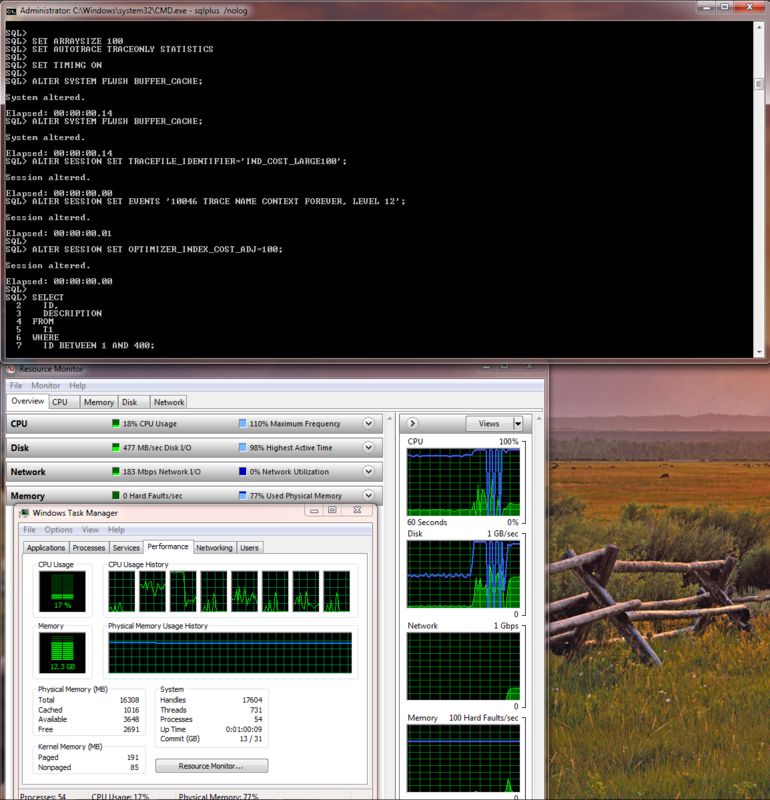 That helped a little, the full table scan completed in 12.01 seconds and used about 24% of the CPU capacity. 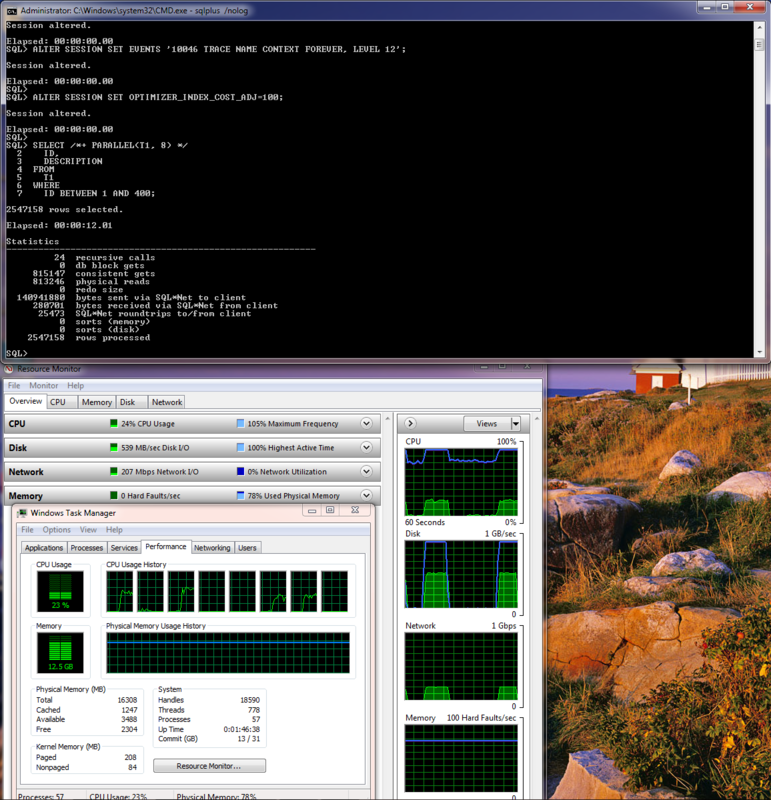 Interesting that the screen capture shows that the network utilization was 207Mb/s – the laptop was connected to a wireless connection with Oracle Database 11.2.0.1 running locally. The full table scan might be IO bound now (note that there were only two datafiles, so I supposed that we could still be CPU bound if only two parallel processes could be used). It might be somewhat interesting to mention that somehow we ended up with one odd 59MB extent in the table, otherwise the extent allocation followed the typical pattern on 16 extents at 64KB, 63 extents at 1MB, 120 extents at 8MB, and then 64MB extents. Interesting – the clustering factor is higher than the number of rows in the table – maybe we should have sampled 100% of the table and index when collecting statistics. It might be a good idea to take a look at the TKPROF summaries for the executions. Just as a reminder, the normal (non-parallel, serial) table scan required 14.39 seconds, the parallel table scan required 12.01 seconds, and the index range scan required 1 minute 24.36 seconds. Numbers from the twilight zone? But wait, there is more. The numbers were so illogical that I took the database offline, rebooted, and was immediately greeted with a warning that the RAID 0 array in the new laptop failed! Try this experiement at your own risk. So, what have we learned from this blog article? To get you started, what was the buffer cache hit ratio for each of the executions? How can you explain the decrease in CPU time when parallel execution was used? Edit August 14, 2010: In case you are wondering, the Oracle database was running on the laptop, not a remote server. The 11.2.0.1 database was configured with Oracle’s default parameters, with the exception of SGA_TARGET which was set to 12G and PGA_AGGREGATE_TARGET which was set to 1800M. Oracle Database on the Windows platform supports only direct, asynchronous I/O. 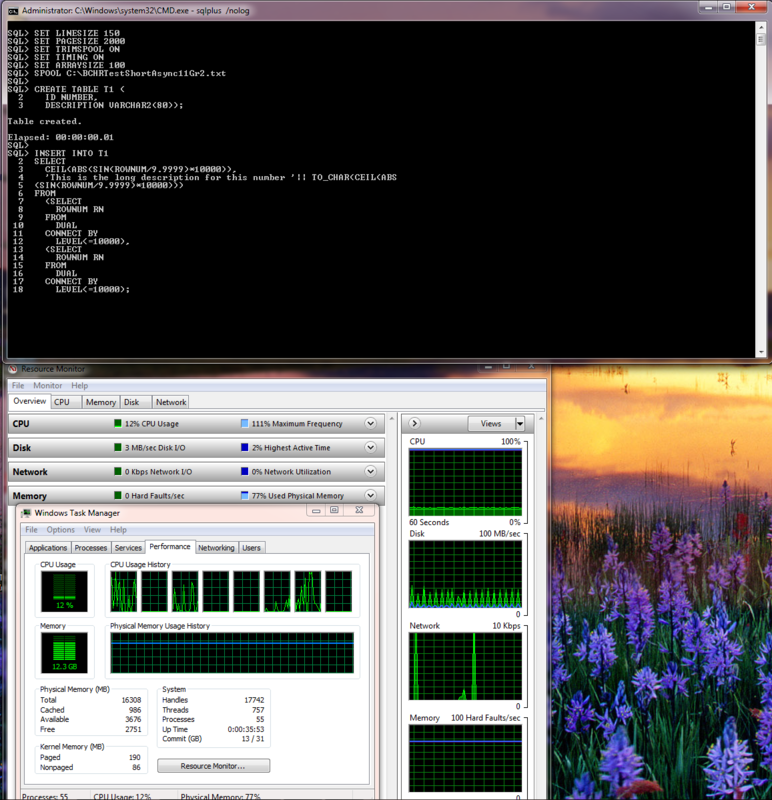 Windows 7 Ultimate running on the laptop does not offer large memory page support, unlike the Server type Windows operating systems.